Livewire is a character in the Valiant Comics universe who has acted both as a villain and as a hero. She became one of the most powerful agents of the Harbinger Foundation and loyally served its leader Toyo Harada before learning his dark secrets. Actress Ciera Foster will play Livewire in the live action Ninjak vs. The Valiant Universe web series. Update we have an interview with Livewire herself Ciera Foster! We are excited to bring Valiant fans an exclusive interview with Livewire herself actress Ciera Foster! She is really cool check out this interview to learn how she has gone from a basketball player to a super hero also her connection with Chuck Norris. Livewire is a powerful psionic teletechnopath who has the ability to control machines simply using her will. She can also mentally link and extract data out of them. She is known for being the powerful enforcer of Toyo Harada and the Harbinger Foundation's elite commandos the Unity Squad. Amanda Mckee is orphaned at a very young and is raised in a group home. The home is implied to be abusive. Toyo Harada the billionaire behind Harbinger Foundation discovers that Amanda is latent Psiot. He takes her into his care and awakens her ability. Due to being rescued from her former life Amanda feels strongly loyal to Harada and becomes both his prodigal student and most trusted agent. She takes on the name Livewire. Harada discovers another Psiot named Peter Stanchek whose powers rival his own. Never having faced another Omega level Psiot Harada begins to become overly controlling and sensitive. Despite, his tyranical tendencies he is often forgiven by Livewire who is still grateful for what he has done for her. When Peter Stanchek attempts to escape the Harbinger Foundation she makes the fateful choice of aiding him, and leaves Harbinger in the process. Livewire is not gone from Harbinger for long. Aric of Dacia aka X-O Manowar returns from space and demands control of Romania for his people the Vine slaves. Harada decides to take action against Aric and convinces Livewire to join his elite strike force, Unity. Unity attacks the forces of Aric and Livewire is almost immediatly able to take down the powerful soldier by stripping him of his X-O Manowar armor. She puts on the powerful armor herself and uses it to crush Aric's other forces. She also is able to stop nuclear strikes by other nations that were being aimed at X-O Manowar. Joining with the armor had the uninttended consequence of increasing Livewire psionic potential and she gained access to all of the hidden records of the Harbinger Foundation and Harada's darkest secrets. Seeing how vile his true intentions were she convinces the Unity team to take on her former mentor. Later, Livewire joins Ninjak in England's MI-6 as they travel to Asia to investigate the enigmatic Dr. Silk. Toylab is a member of the Amazon Affiliate program and so we can bring you these awesome deals on Valiant products directly from Amazon to you. Through her psionic skills Livewire can connect to nearby machines granting her various powers. 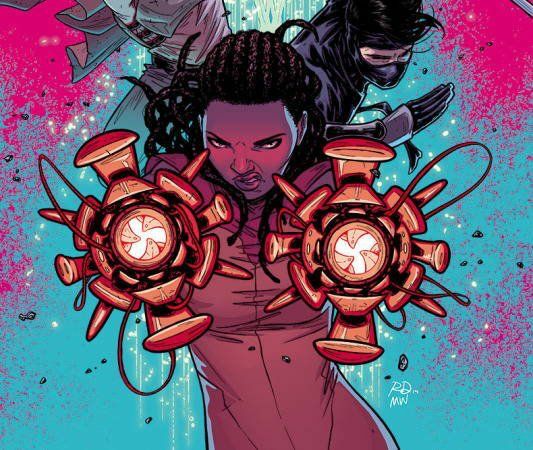 Livewire has also been highly trained in martial arts and weapons by the Harbinger Foundation. Livewire will be a character in the live action web series called Ninjak vs. The Valiant Universe. Actress Ciera Foster will play Livewire in the series.